If you've just bought a new PC with Windows 8.1 or Windows 8.1 RT, you're probably keen to move your existing documents, music, email, Internet favourites, photographs, app settings and user accounts over from your old computer. You can rely on Windows Easy Transfer to complete this – simply move everything over at once or manually. If you don't have a new PC but want to join the world of Windows 8.1 or Windows 8.1 Pro, you can upgrade your current computer and Windows will move your data for you during setup. There are several ways you can transfer your existing mail and contacts if you've been using an older email app (e.g. Outlook Express, Windows Mail or Windows Live Mail) and your contacts are saved to your old PC's hard drive. Tip! The OneDrive lets you organise your email and contacts online using any connected computer or mobile devices using Outlook.com. 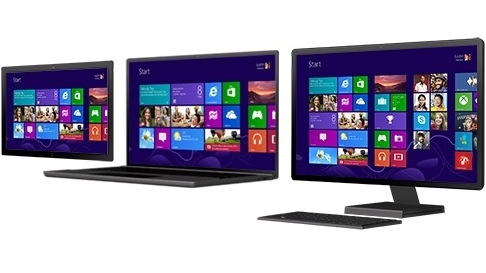 Enjoy easy setup when you use Windows 8.1; within minutes you can add wired and wireless devices to your computer and begin using them as soon as they are properly connected. If you have any problems, check Devices and Printers in the Control Panel. To access your Windows 8.1 or Windows 8.1 RT device, you will require a Microsoft account, which is simply an email address and password. When you sign in using your Microsoft account, your PC is connected to the cloud and many of your account's unique preferences, settings and apps can "follow" you between devices. This means all of your friends contact details and status settings are automatically updated from places like Facebook, Twitter, Linkedin, Hotmail and Outlook. Having a Microsoft account also enables you to share documents and files seamlessly from sites like OneDrive, Facebook and Flickr. Best of all, your personal settings are automatically synced online and between every Windows 8.1 and Windows 8.1 RT devices you use, including your personal preferences, apps, history and themes. What's New with Microsoft Windows 8.1? Windows 8.1 is another step in the evolution of operating systems. Do you remember all the great things about Windows 8.1? Be happy knowing Windows 8.1 has simply enhanced aspects like power, security and ease of use while adding some extra handy features! Feeling a little lost? Can't find the exact file or app you need? Rely on the Windows Search charm to find exactly what you need. All of the Windows charms are located on the right side of your screen. Feast your eyes on the sleek and user-friendly Start screen. Now everything you need and love – documents, contacts, apps – is front and centre on your screen for easy access. You can also enjoy live updates with just a glance at the tiles on your Start screen, which are updated in real time so you're always in the know. For those who prefer the old interface you can still revert to the desktop look, including the Start button. You can access the now faster and easier to use Control Panel and Task Manager on your Windows 8.1 computer by selecting the Desktop tile on your Start screen. Or, you can simply Pin your frequently used desktop apps to the Start screen to save you even more time. To make changes to your settings, you can use Control Panel, PC Settings or by searching. 2. Then select Apps to choose "Control Panel" in the results"
You can also change your computer settings by opening the Settings charm. Here, you can adjust the settings shown (such as: network connection, brightness, power, keyboard, volume) or choose "Change PC Settings" for more options. Tip! An easy way to find individual tasks or settings is the handy Search charm. Select it to enter a word or phrase in the search box and then choose from a list of results that matches your query. Tip! When using Search charm to find individual PC settings, make sure you check both the Apps or Settings for what you're looking for. Apps and Settings icons are listed on the right under the search field. Tip! You can find help about how to use Windows by opening the Search charm. Type in "Help" in the search box and select "Help and Support" in the results. Tip! Learn how to rearrange and add tiles on your Start screen by opening the Settings charm and selecting "Help". Tip! You can make the most of unique apps by learning how to use and customise them. Open the Settings charm and select "Help" to learn more about them. Please note: Some apps may locate their help in other locations so you may want to check the company's website if you can't find what you need in the Settings charm. Tip! You can lock your computer if you aren't using it but don't want to sign out. But once you've locked your PC or if your PC has gone to sleep after inactivity, you must dismiss the lock screen to use it again. Tip! If you want to sign in to a different account on your PC, just select the Back button and choose an account. If you are then prompted to press CTRL+Alt+Delete, do so. Tip! Go to Sign-in Options to see different methods of signing-in to your Windows 8.1 computer. You can switch your PC off or you can simply put it in sleep mode instead. Windows 8.1 and Windows 8.1 RT use very little power in sleep mode and, best of all, your PC starts up faster and you're back to where you left off. Tip! Windows automatically saves your work and turns of your PC if the battery is too low. Tip! The majority of tablet and laptop users only have to press the power button or close the lid because sleep is the default shutdown mode. 1. Go to Search charm and type "Power". Then select Settings (on the right-hand side) and pick "Power Options"
Desktop and tablet users can select "Choose what the power button does". Under Power button settings, select "Sleep" and then choose "Save changes"
Laptop users can pick "Choose what closing the lid does". Next to "When I close the lid", select what you want your laptop to do for when it's running on battery and plugged in. Then choose "Save changes"
1. Closing all of your open desktop apps. This prompts you to save your work. 2. Open the Settings charm. 3. Select Power and choose "Shut down". Apps offer you commands, e.g. New, Refresh and Play, to make using your apps even easier. These commands are important because they control how you want to use an app, such as adding an attachment in an app or making text bold in an email. Tip! App commands stay out of site until you need them to save you space. The app commands will then appear at the top or bottom of your screen or as a menu on a selected item. PC Settings lets you personalise your Start and lock screens, customise the Search and Share charms, add user accounts and change a number of other settings. Touchscreen users: Swipe from the right edge of your screen, tap Settings and then tap "Change PC Settings"
Mouse users: Point to the upper-right corner of your screen, move the mouse pointer down and click Settings and then click "Change PC Settings"
Just like with Windows 8, the new Control Panel includes the same great settings, including: themes and desktop backgrounds, Family Safety, screen resolution and more. Tip! The Settings charm is where you'll find: settings, help and information about the apps you're in. You can also see a few common PC settings, including: network connection, volume, notifications, power and keyboard. These common PC settings are the same everywhere in Windows but each app setting is unique to the app. Tip! If you're still unsure of how to find the settings you're after, you can search your entire computer. Type in a word or phrase in the Search box, tap or click Settings and then choose from the list of results. Windows enables people around the world to share and work with one another in a number of languages. Some countries and regions sell Windows devices with several preinstalled languages. If the language you want isn't preinstalled, you can always add extra languages. Tip! If a language isn't already installed on your PC, you will need to download a language pack. Under Language Control Panel, the words "Available for download" will appear next to a language that is not already installed. Choose Options and follow the on-screen instructions to install that language pack. When you have added all the languages you need, you can type in any of them quickly. You can do this by switching between keyboard layouts or input method editors (IME). Tip! An IME makes it easier to type in some Asian languages (e.g. Mandarin, Korean, Japanese) that have thousands of characters that don't fit on a keyboard. Tip! You can also change the layout of your keyboard for most languages. This will save you more time if you want to have the same keyboard layout for all of the languages you use.